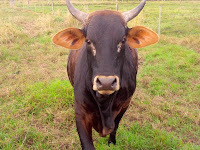 We have owned a couple of cattle (cows), at any given time since we purchased the property in 2011. The initial process required we applied for a PIC number (Property Identification Code) from the DPI (Department of Primary Industry), a requirement of rural properties in Queensland for the keeping and movement of livestock. Primarily our cows have kept the grass down in the paddock, so reduced our overall maintenance, with the ultimate intent of providing beef for the freezer. 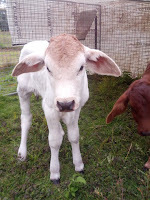 Our initial girls were a pair of Droughtmaster x Brahman heifers (approx. 6-8 months old). 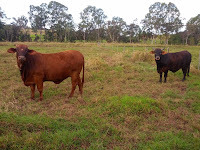 These breeds would not necessarily have been our first choice, but they came at a good price and this was consistent with the rest of the “Community herd”, within which they would roam- due to our paddock not being fenced from the neighbouring properties. 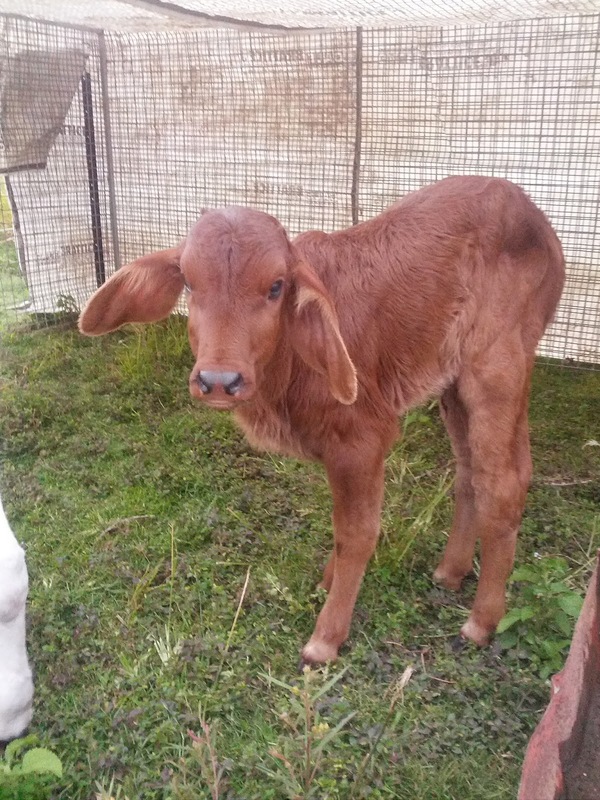 Our next pair were ‘poddy calves’ and came to us at four days old, requiring hand rearing. This was a wonderful experience and makes for exceptionally quiet house cows; though I would not advise this method of acquiring cattle for everyone. As it is very involved and requires commitment, and you inevitably become attached. Again these were a Brahman and a Brahman-Charolais cross, as they were purchased from the local meat works. And Brahmans and Droughtmasters are especially popular in the tropics due to their resistance to ticks, which can be a huge problem. But being a small smallholding, such large animals were not sustainable over the long term. Therefore we have spent time researching various alternative breeds and availability for our eventual breed purchase, once we “had an opening”. We considered a few options, eventually deciding to invest in couple of Australian Lowline cattle from a local beef and livestock producer. The result of a few meetings at various agricultural shows and local food producers functions. Their enthusiasm for the produce, and quality of their produce were enough to lead us to inquire, once the time came. Although not a heritage breed (as are with our other livestock choices) Australian Lowline cattle are descended from Aberdeen Angus (a well known heritage breed). The result of an Australian Meat Research Corporation funded trail within New South Wales between 1973 and 1992. The outcome was an animal approx. 30% smaller than the original breed. Of which a group of interested cattlemen persuaded the Department of Agriculture to sell to the open market, forming the Australian Lowline Cattle Association, August 1992. This recent Australian developed breed requires up to 40% less feed per head (compared to larger breed such as Brahmans)due to their smaller stature; allowing us to sustain 2 animals on a long term basis. 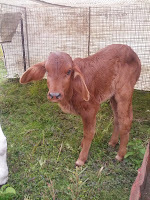 Their smaller size, docile nature (another positive trait) and being naturally polled (so they don’t develop horns) mean they are easy to train, less destructive upon their environment (ground, fencing etc.) and therefore (hopefully) less maintenance. But it also makes them an ideal choice for use around children, something we have not been required to consider in the past. Their smaller stature and carcass make them more compatible with home butchering, and whilst this does equate to less meat per animal come D-day, the bone to meat ratio of the carcass should be better. With prime cuts such as the eye fillet should be up to 30% larger than larger breeds (such as Brahmans) and the naturally marbled meat (without the need for grain feeding) offering a quality end product. This breed are also considered highly fertile and ‘easy calving’, with calves typically weighs 18 to 24kg- an advantage to novice breeders. An option that would not be possible upon a block the size of ours, with larger breeds.